Whether you are stumbling on this website for the first time today, or whether you’ve been a Strong Towns advocate for years, you’re probably not a fan of Walmart. Big box stores are not really our thing here. We know that they create a far smaller tax base than your average mom and pop shop, that they take economic value out of our communities, and that they dominate town landscapes with their unnecessarily massive parking lots and ugly buildings. But there’s another problem with Walmart, and it matters because it hits the most vulnerable people hardest: The problem is that Walmart systematically depends on the poverty of communities. Indeed, Walmart would not exist without poor people. First, Walmart needs them to work in its stores. Walmart needs people so desperate for employment that they will be willing to go 10 hours without a break, accept wages below the poverty line (causing a drain on public benefits) and never have a forum to address their grievances. Second, Walmart needs people to buy their products, and a good portion of those customers are poor. These forces combine to make Walmart a significant player in creating and sustaining poverty in towns across America. I suspect other big box stores have a similar effect on poverty in their communities, but Walmart is a clearly documented and particularly problematic example. There have been several articles and papers on this topic, but for time’s sake, I’ll just talk about one today. A decade ago, two professors from Penn State, Stephan Goetz and Hema Swaminathan, came out with a study called, “Walmart and County-Wide Poverty.” Using econometrics and building off previous studies, the authors concluded that counties which added Walmart stores or had a considerable amount of Walmart stores over a period of 11 years (between 1987 and 1998) saw higher poverty rates than counties that did not. They write, “These results have potentially profound implications for public policy related to big box operations. In particular, the chain is not the engine of local economic growth that the company's spokespersons and public relations materials suggest." Indeed, in several counties, Walmart has been responsible for stagnation and decline. That comes, in part, from Walmart’s insistence on keeping its employees at very low wage rates. Despite employing over 2 million people in the world, the average Walmart “associate” makes just $8.86 per hour, which amounts to well under $20,000 annually if that employee were working full time. And when you account for the fact that many employees are intentionally made to work part time (thus cutting them off from benefits), the average annual salary is even lower. On top of that, these employees’ hours are often unpredictable, making holding additional part-time jobs a serious challenge. All of this means that in counties where Walmart is a major employer, much of the population is living near or below the poverty line because they have no other option. As a result, many of them rely on public benefits like Medicaid and the Supplemental Nutrition Assistance Program (food stamps) to survive, which naturally creates a big drain on government resources in those communities. Forbes reported that Walmart workers cost taxpayers $6.2 billion in public assistance in 2013. We already know that stores like this disrupt the fabric of our towns by undercutting local businesses and pulling profit away from the community, but its disturbing to acknowledge that Walmart is also intentionally creating a population that relies on public benefits when it could afford to pay its employees more--enough to actually thrive on--if only it didn’t pay its owners so much. Instead, Walmart leadership has chosen to keep millions of people underemployed to fuel its own greed. 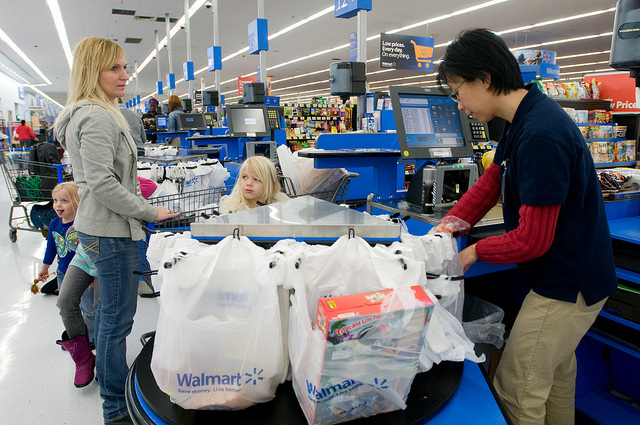 The average Walmart customer has a household income of less than $40,000 a year. Now, Walmart doesn’t just rely on its poor employees, it also relies on poor customers to buy its cheap junk. The average Walmart customer has a household income of less than $40,000 a year and 1/6th are on food stamps. (Side note: This is yet another way that Walmart profits off of and depends upon public benefits--thousands of dollars in food stamps are being spent on Walmart products every day.) This is not to say that wealthier people don’t choose to shop at Walmart; they do. But the operative word there is “choose.” Most middle and upper class families would easily relocate their purchases to another store if Walmart wasn’t convenient for them, or if Walmart didn’t exist. In short, while there are many factors that create and sustain poverty in America, counties with a Walmart have a greater likelihood of being low-income, and keeping their residents trapped in that cycle of poverty. If we didn’t have enough reasons to fight against Walmart’s encroachment into our towns, now we certainly do.